This list pretty much sums up the household/family cooking needs of America, and I’m not kidding here. 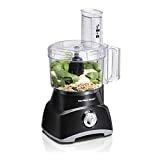 This is the list of best seller food processors on Amazon, one the most visited online shopping site which has some of the best deals you can find. Maybe you can find your pick here too. Medium size families love medium size food processors like this one. It chops, slices, and shreds like no amateur and even whips up bread dough. The design award goes to its new bowl cover which, in place of a feed tube, has a plain opening for feeding ingredients. Thumbs up for not having to stab a scrubby through a tube to clean it! This food processor simply fulfills everyone’s needs by being easy to assemble, use, and clean up. One dial controls the power and pulse; a kid can figure it out. Watch out for the sharp blades! You’ve got to give credit to this small food processor for producing even and fine chopping when you need it. Whether it’s a dash of nuts for ice cream topping or breadcrumbs for frying fillets, there is no other chopper like this one. It must be how the blade spins that helps the food get distributed and chopped up evenly. This little food processor also makes the finest purees and dips. The assembly is easy, and you can handle the blade safely by its extended stick. If you are going to use a lot of power for heavy work like beating dough and large batches of food, you are going to need this food processor. It goes through everything like a hurricane through a cowboy town, and yet it is not at all loud. The huge bowl with feed tube can make enough for a big family. You will certainly need some space on the counter top for this giant of a food processor, so make sure you have it because it will be too cumbersome to move it about. Nothing fancy, just an electric chopper for small tasks. This might be a nice and inexpensive gift for new couples, for chopping anything from onion to nuts. Just press the button for as long as you want it to chop – quickly for pulses, and a couple of seconds for fine grind. It is quite basic and a no-brainer to put together and take apart, but take care to place the bowl in the locked position or the chopper won’t start. Safety measures, see? If stuff gets stuck under the blades, you’ll have to use a spatula. If you are looking for power, speed, and the ease with a medium size food processor, this is probably it. This buddy is good value for money as it turns your potatoes, carrots, and whatnot into perfect, even-shaped slices as fast as you can say ‘salad.’ It also makes sauces, pesto and grates cheese well; are you already thinking of a pizza? KitchenAid KFC3100 is the best food processor for small size jobs. The reverse spiral action of the blade produces uniformed sized meats, nuts, vegetables, fruits or whatever ingredient put in. If you love the Cuisinart brand food processor, you should check out this 4-cup mini food processor. Cuisinart DLC-4CHB is bigger than the Cuisinart DLC-2 food processor and have received very good rating overall from the users. A food processor that is perfect for two people. You can make salads, sorbet and more with this Cuisinart DFP-3 food processor. 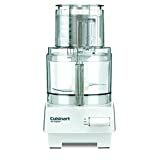 This mini food processor – Cuisinart DLC-2 is top of its class but constantly being compared with the KitchenAid KFC3100 – best mini food processor. 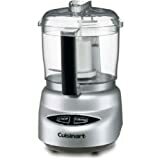 Cuisinart DLC-2 mini food processor excels in the area of processing softer food category. This mini Cuisinart DLC-1BCH food processor works great, but you need to read the instruction to know how to use it properly. Overall, this is one great value mini-prep food processor. 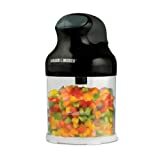 This Black & Decker EHC650 3-cup 2-speed Food Chopper seems like receiving a good number of praises and commendations from the users. They have acclaimed it’s easy maneuverability and its easy-to-clean attributes. Homemade baby food is healthier than those store bought jars of puree that contain preservatives, and we have peace of mind knowing what goes into baby’s mouth. In any case, baby food is very easy to make by steaming the vegetables until soft and then turning them into a puree. I used to make it for my children with just a steamer and my usual food processor, but my sister wanted a baby food processor (which is a 2-in-1 steamer and processor unit) for those times when she travels. 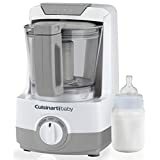 Many consumer sites recommend the Beaba or the Brezza, but I searched for some time and found this Cuisinart unit for the best value – it is a steamer, food processor, and bottle warmer all in one! The price is even lower than the Beaba, and we love the look of this simple gray and white unit which is going to fit in anywhere. It is compact – a coffee maker might be bigger – and easy to use with a dial for steaming and pureeing. The convenient bowl is also a large 4-cup size, which means we can prepare a few batches in one go, and keep them in the fridge until baby needs them. Simply dice the vegetables or fruits (baby loves squash and apples) and put them in the bowl with the right amount of water, then turn the dial to ‘Steam.’ When steaming is done, turn the dial to ‘Chop, ’ and the processor will make a smooth puree. All of this is done in no time. Clean up is easy too! The bottle warmer is a nice addition which works nicely keeping one bottle warm for baby. We use it to keep a bottle of pureed food warm! The Beaba is the best food processor for baby food according to ConsumerSearch. It is a steamer and food processor with assorted colorful housing and a large 4.7-cup bowl and yet very compact; even smaller than the Cuisinart because it doesn’t have a bottle warmer. It’s pretty if you like colorful baby stuff. You can cook and blend a batch of baby food to keep in the freezer, then reheat or defrost it in the Beaba itself. The control is a very simple dial-and-button-in-one, and it only takes about half an hour to prepare a bowl of baby food. 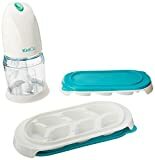 On the other hand, if you are looking for a cheap and simple chopper or mill that will blend steamed food into a puree, this is a good baby food mill that works. If you have used some of the cheap mills before, you know how they don’t puree food into a smooth consistency, leaving chunks of food that you need to mash by hand. This is not one of them. This food mill simply works by placing the housing on the jar and pressing down to start the motor. The super sharp blades then turn everything into goo, including chicken or ham. After that you just throw the parts into the dishwasher or wash them by hand; it’s really easy. Storing and transporting this appliance is even easier because it is so small. Hi, welcome to my Best Food Processor blog! I’m Kristine, and I love to cook for my family. I used to spend a whole lot of time in the kitchen preparing ingredients before I found out about the wonders a food processor can do. Now I just pop everything into my best food processor and press a button! All these functions can be done by just one food processor; you only have to change the attachment or blade for the right work. Well, how do you choose the best food processor? I will post some tips here on my blog because I have bought so many food processors over the years in search of the best one! I think it’s worth spending the money for a quality food processor. Why should I be grounded in the kitchen mincing meat, cutting vegetables and chopping nuts, when I could be having a fun time out with my children and hubby, don’t you think so? The best food processor for you should have the right capacity for your family size, a good variety of attachments for different kinds of food processing, a wide feed tube or chute, and quality blades. If you want to know more about how to choose the best food processor and my recommendations for the best food processors, do stay and explore my food processor blog! Does your food processor come with various attachments and accessories? Make use of them to get the most out of your food processor. Here’s a list of food processor attachments and accessories you might be interested in using, and you can always buy them separately as long as they fit with your food processor model. Every food processor has this blade to shred, cut, slice and grind food. It has two blades on opposite sides of the center shaft and they curve towards different directions to make an S shape. Metal blades are better than plastic ones because they stay sharp and last longer. Looks like the S-blade but with straighter metal or plastic blades. Mixes dough for bread. The one with large paddles at the end of two straight arms. This is used for beating eggs, but I don’t use it because the normal whisked egg for cooking can easily be done by hand with an egg whisk without going to all the trouble of washing the food processor, while the beaten eggs for baking cakes should be done with a mixer which will give better results. Maybe one can use this attachment for whipping egg whites for small size desserts like mousses. The metal disc with a row of narrow teeth that can cut food into long and thin strips. The metal disc that looks like the Julienne disc but with larger teeth that cut food into fatter strips. A dome-like attachment to fit on the shaft and juices citrus fruit like oranges, lemons, and grapefruit while it turns on the shaft. Lets you juice fruits or vegetables by feeding through the feed tube. The juice is strained to the bottom of the bowl while the pulp is kept in the middle. To alternate between tasks if you don’t want to wash the bowl each time. For scraping the sides of the bowl. I’ve gone through it, washing a food processor means taking apart everything, then soaking and cleaning each part under the sink, and then putting them back together, and it takes ages to do. I didn’t like to use the dishwasher for it because that takes a long time as well, and it’s not like I’m only using the food processor once a day. So I’ve devised two very fast and easy ways to clean a food processor. One is for cleaning after processing the usual food like meat, veggies and so on, while the other is for nut butter. What you need: Two small tubs, dish detergent or mild soap, dish cloth or sponge. As soon as you’ve finished using the food processor, don’t let it sit around. Immediately take apart all the removable parts (except the base) and place them in a small tub. The parts should be placed loosely and not stacked together too much. Take the tub to the bathroom or garden hose and hose down the parts with a strong spray of water to get rid of loose food residue. Try to lose as much residue as possible. Move the now less dirty food processor parts into another clean tub. Drain the original tub and fill it with clean water. Use the dish cloth or sponge to rub through each part with dish detergent or soap. Be careful with the blades. Once you’re done, pour the clean water from the first tub into this tub. The rush of a large amount of water will be able to wash away the rest of the dirt and partly rinse the food processor parts. At the end just drain away all water and rinse the parts clean of any detergent or soap. Dry the parts with a clean towel or let them air dry if you are not using the food processor immediately afterward. What you need: Paper towel, dish detergent or mild soap, dishcloth or sponge. Again, clean the food processor immediately after use. Remove all the parts from the base which needed to be cleaned. Use a paper towel (or two) to wipe the parts clean of nut butter. Remove as much residue as possible. Use the dishcloth or sponge to rub through each part with dish detergent or soap. Be careful with the blades. Rinse the parts clean of detergent or soap. If any of the parts are still dirty, repeat step 3 and 4. The base cannot be submerged in or poured with water. Just wipe it down with a wet cloth. If there are stubborn stains, use baking soda paste. But there shouldn’t be stubborn stains if you clean your food processor after each use. Hope my tips are useful for you. Most food processors come with a variety of blade attachments, and each of these has a different function. You need to choose the right blade for the right work, or otherwise, the result will differ. 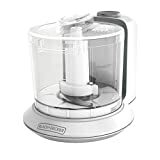 Usually, the manual will tell you which does what, but if you’re still unsure, check out my post on Food Processor Attachments and Accessories to read more about them. Attach the blade you choose to the food processor. Be careful while handling the blades and be sure to attach them correctly to avoid accidents. The edges of food processor blades are very sharp; that’s why they do a good job in shredding and slicing. If it’s vegetables, you want to shred or slice, wash them and get rid of any parts you don’t want. For example, if you only want to cut the stalks, pluck off the leaves first; and if you want to dice potatoes or carrots, peel the skin before putting them in. You get the idea. Then place the food into the attachment bowl, filling it up until the marked level. Close the lid and place the bowl in the food processor if you haven’t already done so. When the food processor is working, and the food inside has subsided a little, you can add more food inside by pushing them through the feed tube (which is available with most food processors now) with the pusher. Chop with the pulse button instead of just turning the food processor on, one pulse at a time until the food is at the exact consistency (you should be able to see it through the plastic bowl). If you just turn it on, you might get puree instead. You can grind nuts to go from big pieces to small pieces, then to thick butter and finally thin butter. Just turn it on and let it grind until it becomes the consistency you want. Keep an eye on it as not to overdo it. You can turn it off just before it’s right and use the pulse button a few times. Shred cheese with the pulse button. Freezing the cheese for 15 – 20 minutes before shredding will make them easier to shred. If you’re unsure about which speed to use, or whether to use pulse, just remember that the longer the blades are kept turning, the finer the food will become. Unlike some people, I do not have the luxury of a big kitchen. Counter top space is valuable, and it is a challenge to find room for my appliances. I constantly find myself lusting over various kitchen appliances but unable to get them all because of space limitation. Bummer! So, it was a no surprise when I was standing in the kitchen appliance aisle with a blender in one hand and a food processor in the other, weighing which one I could do without. It turns out; I need both. While they do share some similarities, they each are great to use for certain foods and functions. On lazy days, I substitute my knife with my food processor. I use it to chop, slice, mash, julienne, and slice (to name a few) food. It is also great when I want to make doughs and frozen desserts. With a wider working bowl, you will be able to work with larger, bulkier ingredients. Food processors usually have a liquid limit, make sure you do not overfill it. Blenders excel when you need to deal with liquids and substances that are high in liquidity. You can easily fill your blender up without worrying that it will leak. Thanks to my blender, I’m able to get the right consistency for my soups, margaritas, and smoothies! They usually have serrated blades, making them great for processing tougher ingredients. Additionally, food processors have a wide range of accessories and utilizing your food processor in the manner that you need. While not serrated, the blades of a blender are designed to aerate the contents. This will also force air into your mixture which can affect the consistency of your mixture. What is the result like? Since the food processor’s blade does not rotate as fast, it will not turn your food into mulch as fast, making it great for chopping and slicing. The pulse function of the food processor will also give you more control on the size of your ingredients. In fewer words, if you want your food to be less ‘refined,’ this is the tool for you. Unlike the food processor, blenders are faster and thus have more power to pulverize food. Blenders usually have different speed settings, so you will be able to gauge how smooth you want the consistency of your food to be. At the highest setting, a blender will be able to process grains or nuts into flour. If you are on a tight budget, your first instinct will probably be to get the blender over the food processor since they are usually more affordable. With much experimenting, you will probably make do with a blender to chop and dice your food. While the blender is great, I think a food processor is worth to invest in – especially for aspiring cooks who like experimenting in the kitchen. You can now even get a blender/food processor combo but just make sure they are from a good manufacturer to ensure its durability.